It is a local landmark and it will be back in business this coming week, as the Barley Vine Rail Co. will open its doors under new management. The popular restaurant closed over a year ago then was reopened but was only serving for a couple of days each week. 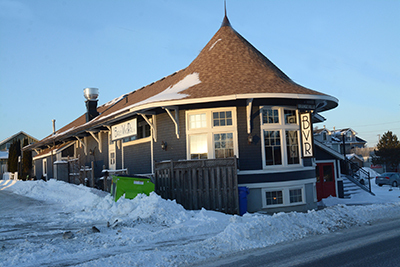 The former Orangeville train station was built during the heyday of rail travel in the 19th century. It was declared a heritage building and was moved to its current location on Armstrong Street in several large pieces. New owners Angela Ward and Mark Latkolik are excited to be the new hosts of the this restaurant and are adding some unique new features to both the building interior and the menu. When the BVR, as it is known locally, became available, Angela said they immediately knew it was the place for them. Angela and Mark have decided on a unique niche for the restaurant to provide a very Canadian experience both in ambiance and on the menu. Angela said that while they will be making some changes, much of the restaurant will stay the same. With the final touches now being put on the new interior renovations, the Barley Vine Rail Co. will be opening its doors next Wednesday, February 13.